New Horizons is speeding through an ocean of space among the giant planets and the nearly 2.5 billion-mile expanse of the middle solar system. Onboard our spacecraft, all systems are “go” and we continue to speed outward at nearly a million miles per day. 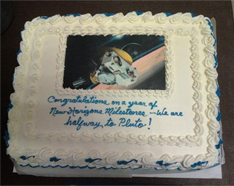 Anniversaries are important, and this past January, New Horizons marked its fourth launch anniversary. 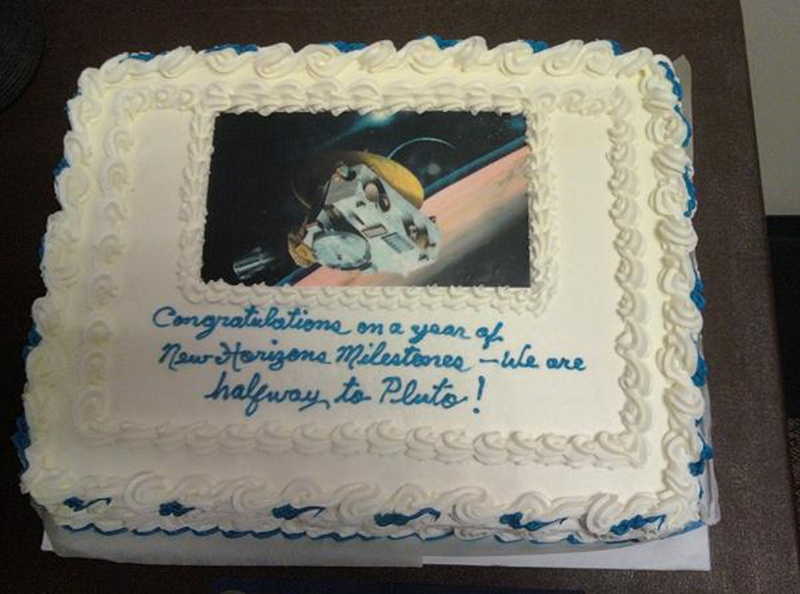 Also in January, Pluto celebrated the 80th year of its discovery! And as you may already know, New Horizons has passed its main mileage halfway marker in the voyage to Pluto; that occurred on Feb. 25 — though as the table below shows, there are other halfway milestones we like to use. Halfway points across the ocean of space en route to Pluto (followed by date and New Horizons' distance from the Sun � in astronomical units � when the milestone was/is reached). And although we’ve crossed half the miles now, our spacecraft is slowing down as it pulls away from the Sun, so the halfway point in time comes rather later than the halfway point in miles. But on Oct. 17, we’ll have half of the flight time to Pluto behind us as well. Since my last posting, our spacecraft has largely been hibernating. The sole exception to this was in January, so that we could run a few maintenance functions on spacecraft subsystems, re-point our antenna to Earth for operations this winter and spring, and test new software on our Solar Wind Around Pluto (SWAP) instrument. But next Tuesday, on May 25, we will wake New Horizons up for a jam-packed nine weeks of testing and other activities that form our fourth annual checkout, or ACO-4. We alternate simple and comprehensive annual checkouts; simple ones occur in odd-numbered years like 2009, while comprehensive checks occur in even numbered years, like 2010. So this year’s ACO contains a lot more activity than either last year’s or next year’s ACOs. ACO-4 divides into four basic parts. The first couple of weeks (May 25 to June 9) are devoted primarily to spacecraft activities; this is followed by almost three weeks of (mostly) payload-related activities and an encounter-mode test (June 10 to June 29); then we perform a course correction on June 30; and finally, we’ll conduct most of our heliospheric cruise science and prepare for reentry into hibernation (July 1 to July 30). One of the first major things we’ll do when we wake the spacecraft up next week will be uploading almost 20 minor bug fixes and other code enhancements to our fault protection (or “autopilot response”) software. Later, we’ll conduct all the standard checkouts of our spacecraft backup systems, and we will also be thoroughly checking out and then re-calibrating our seven scientific instruments, taking a fair amount of cruise science data with observations made by the Long-Range Reconnaissance Imager (LORRI), Ralph, Alice, SWAP, and the Pluto Energetic Particle Spectrometer Science Investigation (PEPSSI). What about that course correction? Well, our navigators at KinetX Corporation in California have determined that we are slightly off course due to a tiny thrust force from—get this—the soft reflection of thermal photons from our radioisotope thermoelectric generator (RTG) power source off the backside of our high-gain antenna! This effect is tiny, but over four-plus years has put us slightly off course. To put us back on course, a change in speed of less than 1 mile per hour is needed. But with so many hours to go to Pluto (about 45,500! ), you can see that we’d be pretty far off our encounter aim point if we didn’t make this adjustment. So, using our onboard thrusters to change our course for the first time since October 2007, we’ll burn our engines for about 30 seconds. And regarding this summer’s cruise science, our Ralph and LORRI imaging targets will include Jupiter, Uranus, Neptune and Pluto, as well as some of their satellites. Our heliospheric cruise science will consist of almost four weeks of SWAP and PEPSSI observations of the space plasma (charged subatomic particle) environment out in the region we’re traversing near the orbit of Uranus, and some Alice ultraviolet observations of the hydrogen and helium atoms that pervade our solar system. In addition to monitoring our distant spacecraft during hibernation and planning the intense summer of ACO-4 engineering and science activities that are about to begin, we’ve also been planning the four days of encounter operations just before, and also the four days of encounter operations that occur just after, the nine-day closest approach period near Pluto. This has been going well, and we expect to complete this work after ACO-4. We’ll then turn to planning the months of approach to Pluto; and when that is complete, we’ll plan some backup encounter scenarios that account for potential instrument or spacecraft failures. We want to be prepared for these contingencies before we ever begin the encounter in January 2015. I also want to tell you about the workshop we held last week, at the Space Telescope Science Institute in Baltimore, to focus on what we know about Pluto’s small moons Nix and Hydra. 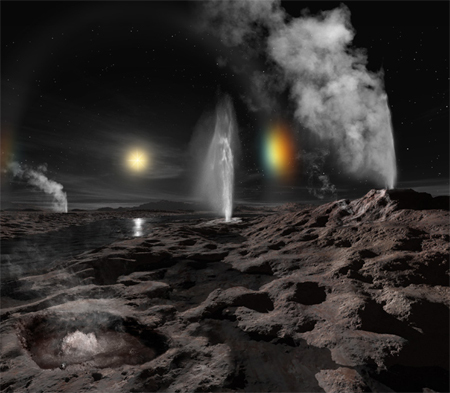 As timing goes, the workshop came five years after the moons were discovered (using the Hubble Space Telescope) and five years before we encounter them (with New Horizons). Studying Nix and Hydra from here on Earth (or even in Earth orbit) is hard, owing to their great distance, small size and extreme faintness. But over the past five years we’ve accurately mapped out their orbits, determined their colors, and constrained their diameters to be between about 40 and 145 kilometers (about 25 and 90 miles). It has also become clear that Nix and Hydra are somehow intimately related to Charon, as evidenced by their similarly circular and near-zero inclination orbits, and their orbital periods, which are extremely close to being exact multiples of Charon’s. Although no major breakthroughs about Nix and Hydra were announced at the workshop, we did determine that a combination of new Hubble data, along with hoped-for observations to be made with the National Science Foundation’s new ALMA radio telescope array in 2011 and 2012, could soon give us more accurate orbits, sizes, and perhaps even shapes and/or masses for the pair. These kinds of facts would be a great help in planning our flyby observations for 2015. Well, that’s my update for now. Thanks for following our journey across the ocean of space, to a new frontier. You’ll see updates from the mission team as we exit hibernation next week and around the June 30 course correction. And I’ll be writing again before we enter hibernation after ACO-4 at the end of July. In the meantime, keep on exploring, just as we do!